Using Hemp to make a fashion statement for the 4Th of July is a good way to show your love for the USA. 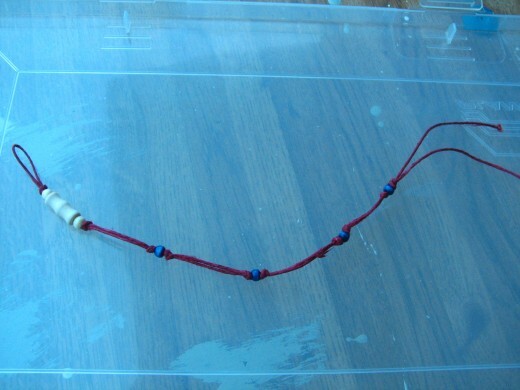 Hemp is available in many colors and using Red, White and Blue hemp cord to make a variety of bracelets is a lot of fun. 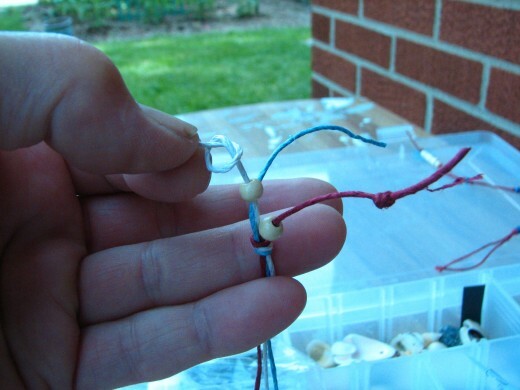 You can make these simple bracelets for yourself or have a holiday get together and use this project as a way to share your country loyalty and a good time with friends and family. This would also make a nice gift or memento for the up and coming 4TH of July Holiday. 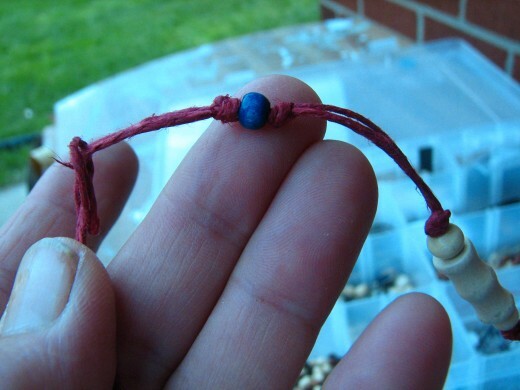 Follow these step by step instructions to make your Red White and Blue hemp bracelets. No matter what your family plans are for the holiday, this 4TH of July you could include this activity anywhere. It could be done in the car while you are traveling to keep the children busy. It is also a good way to set everyone in the family down under a shade tree in the park during a family reunion. You might have some bored youngsters who can't seem to find anything to do now that school is out. Having them gather for a bracelet making activity is a project they can enjoy and later give the bracelets as gifts. 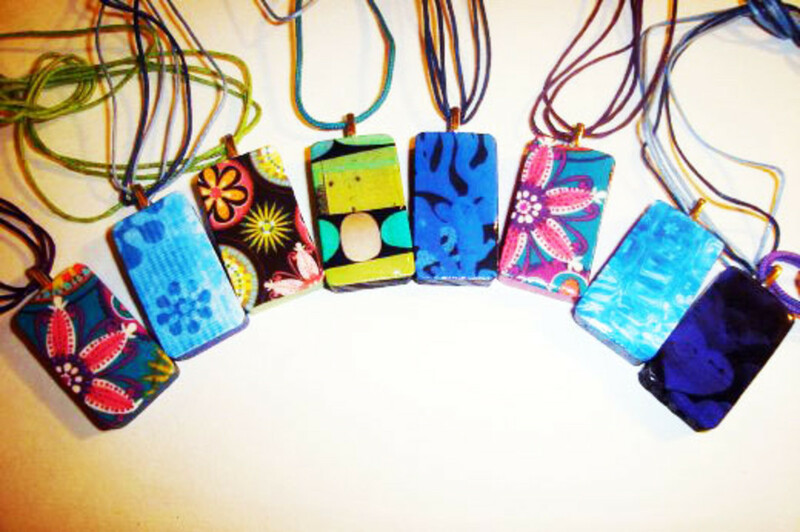 The 4TH of July can be a fashion statement when everyone makes and wears one of these easy hemp designs. 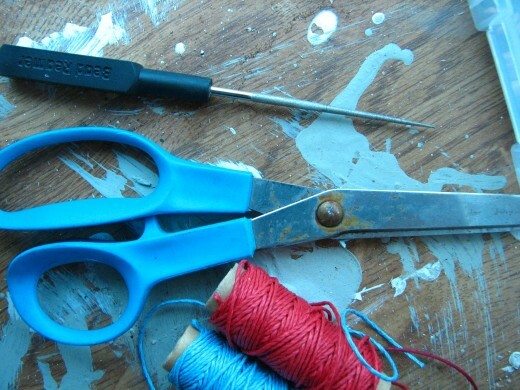 Other than scissors you really only need the hemp cord. 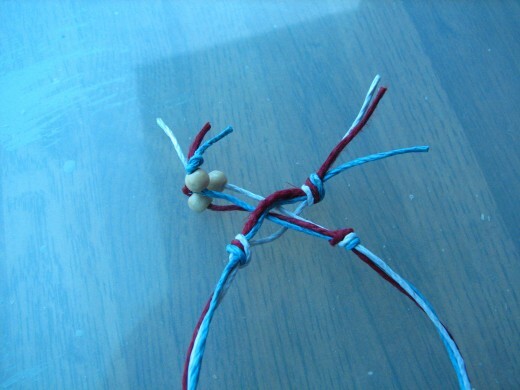 The bracelets can be made by tying and knotting the cords. Adding beads makes it more fun. It also makes the finished bracelet a way to express your creativity. Now, when finding beads it is always best just to pick out what you like. 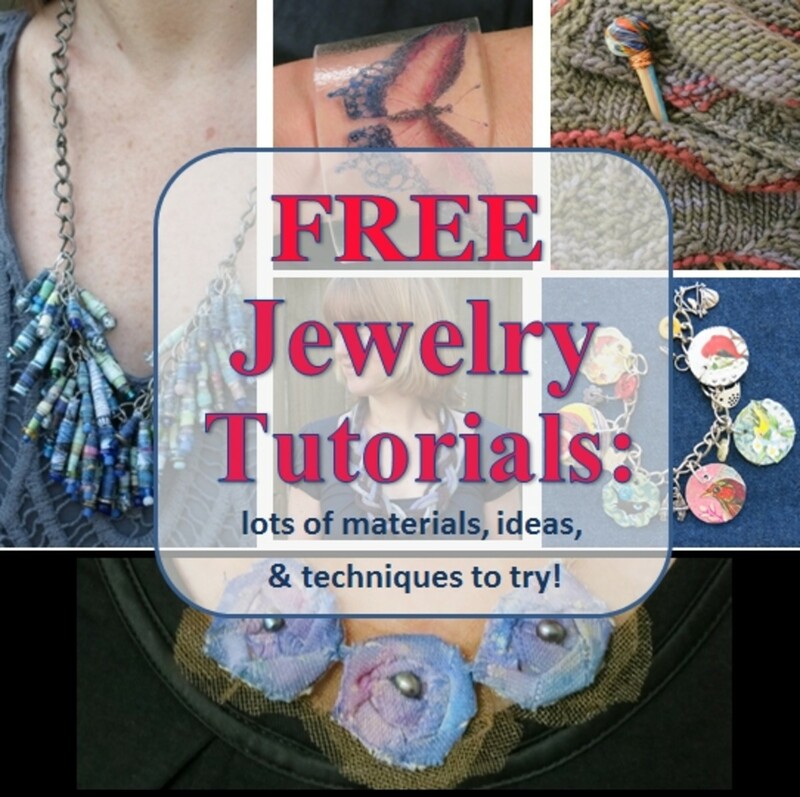 There are so many different kinds of beads, that your choices are very broad. Just be sure to get beads that will string on hemp cord. Hemp cord can be purchased in most craft stores or on the web in a wide range of colors and sizes. 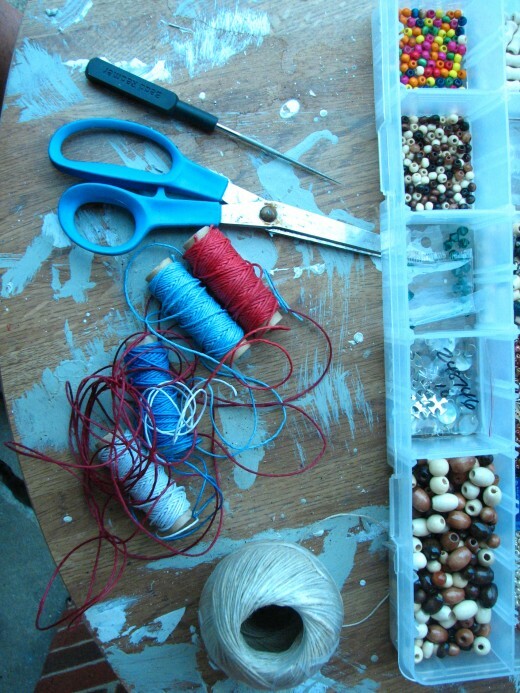 Use smaller cord with smaller beads and larger cord for larger beads. When you start making your bracelets they can be mixed and matched to turn out different designs even if everyone is using the same materials. This is part of the fun of doing this as a group project. 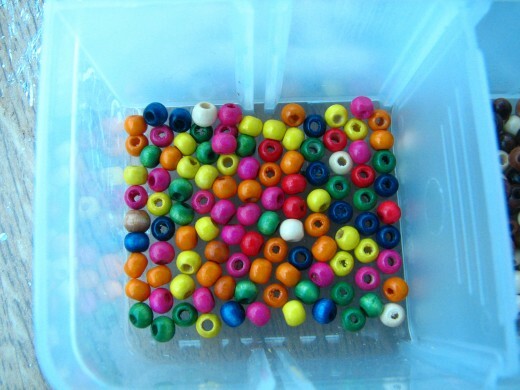 You might also want to try finding some beads that can be recycled from a broken necklace or an old piece of beaded jewelry. 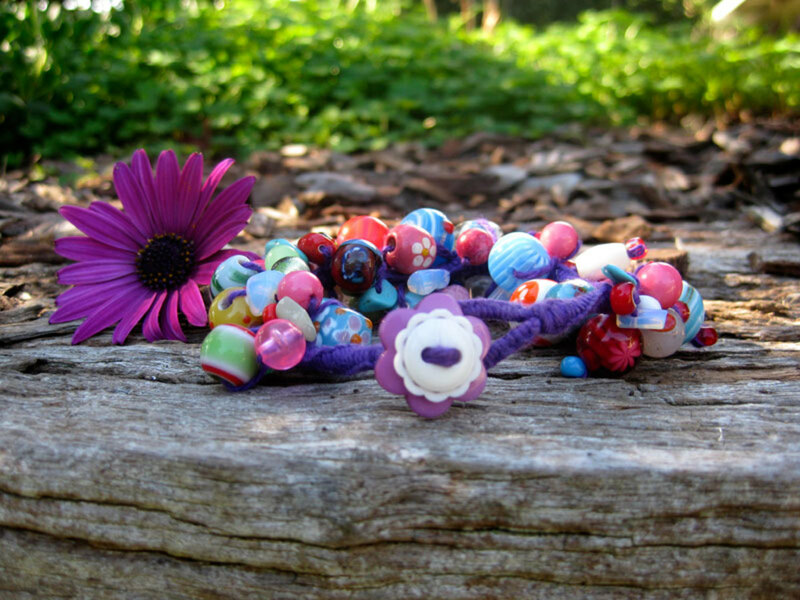 A suggestion would be to get an unwanted piece from an older relative and make several bracelets with beads from the old piece so everyone could have a keepsake. Charms could also be added to this type of bracelet. A large jump ring knotted in to your design would be the perfect way to add charms that might include a flag, USA letters or other sort of Americana Memorabilia. 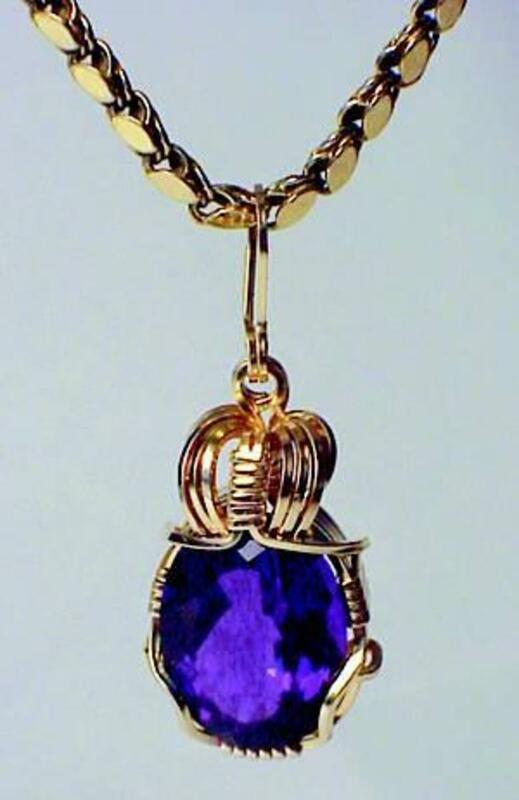 This option would necessitate the need for a pair of jewelers pliers to attach the charm. 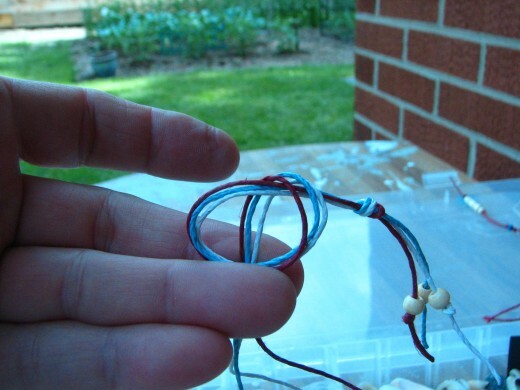 Make the cords for each bracelet at least twice as long as you need them to be. 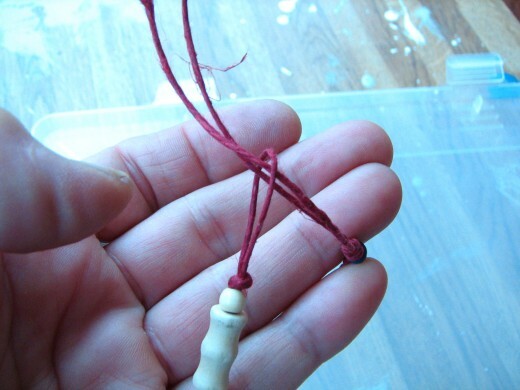 For the red hemp bracelet shown in these photos the cord was cut to two feet, then doubled by folding in half. Do not cut it in half, just fold it to make two adjoined strands. 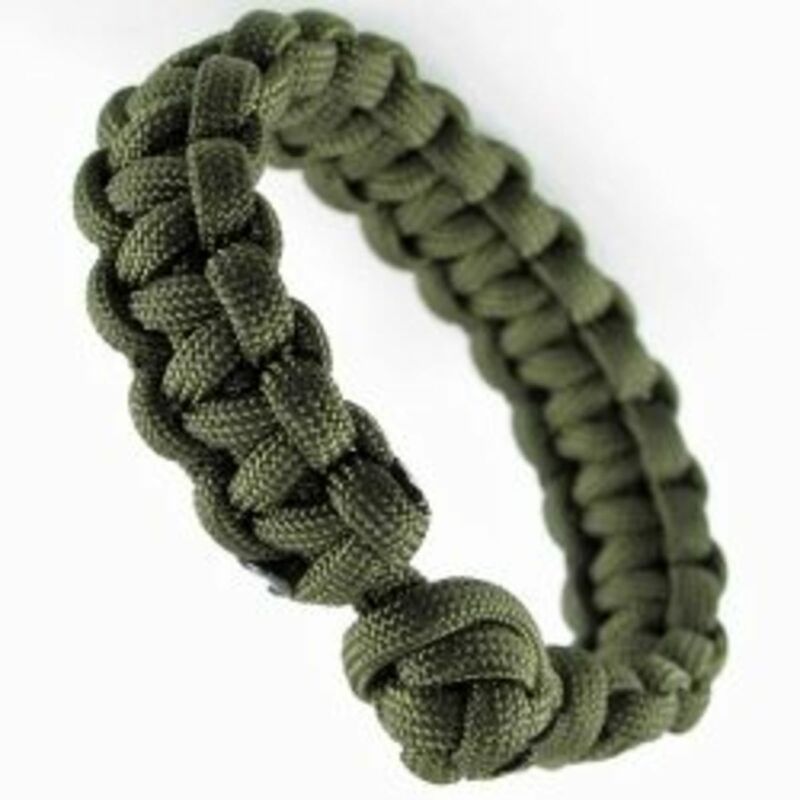 This turns out a bracelet that is about 7.5 inches long and can be adjusted when tying on to the wrist or ankle. 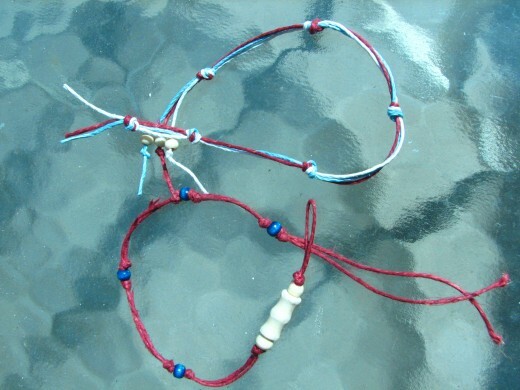 The multi-colored hemp strand bracelet each red white and blue hemp cord was all cut the same length, about 14 inches, and then knotted together toward the end. 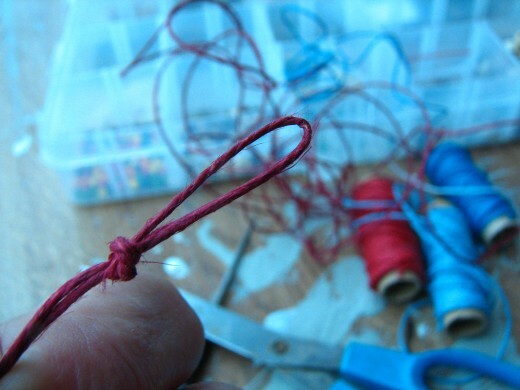 It is important to have the extra length for tying knots. 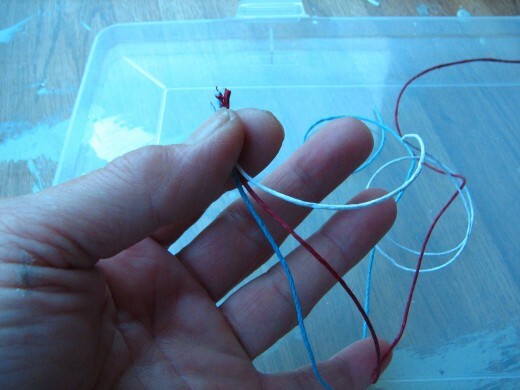 The excess cord can be trimmed off when the bracelets are finished. 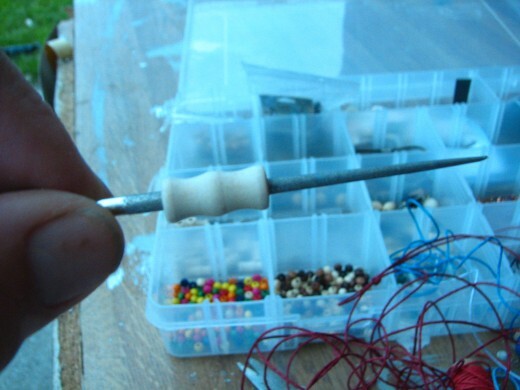 The beads you decide to use should be reamed and slid on to the hemp in a pattern you like. The first bracelet was started with a simple 1-2-1 pattern and then the beads were held together tightly and knotted in to place. 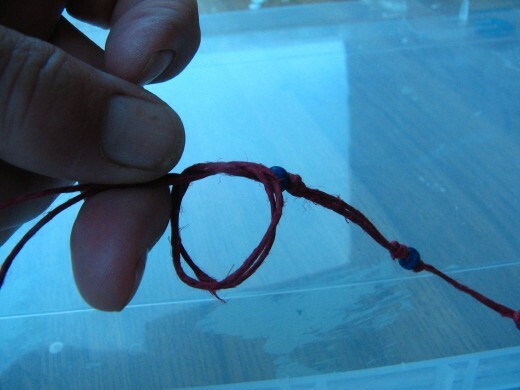 A space of about one inch was skipped and then another knot was tied then a blue bead and then another knot. 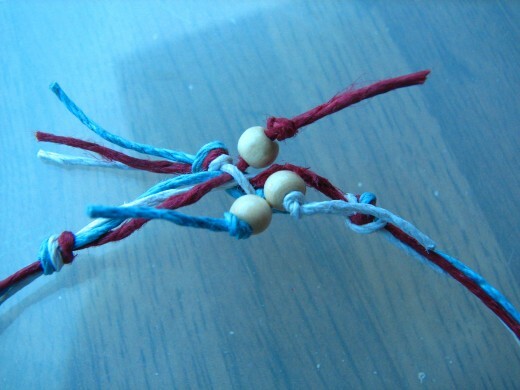 This knot and blue bead and knot pattern was repeated until the desired length was achieved. This also repeats the 1-2-1 pattern used with the beginning beads.Try to tie the knots in a uniform pattern to add to the overall design quality of the bracelet. 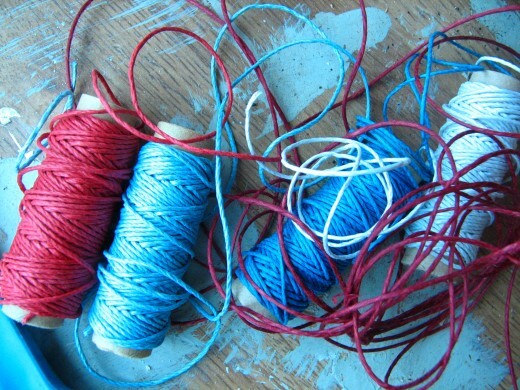 Small children may need assistance in placing the knots and with tying. This is a good way to teach the smallest ones how to tie and about counting and patterns. This makes this an educational process and they do not even realize they are learning because they are so busy having fun. Encourage everyone to make their own unique patterns so that each one is special when it is finished. I made two different bracelets for this hub to show how using the same materials can turn out very different bracelets. It is all about having fun and do not forget that it is also about expressing the love for our freedom and the good old USA with this handcrafted, fashion designed, jewelry. 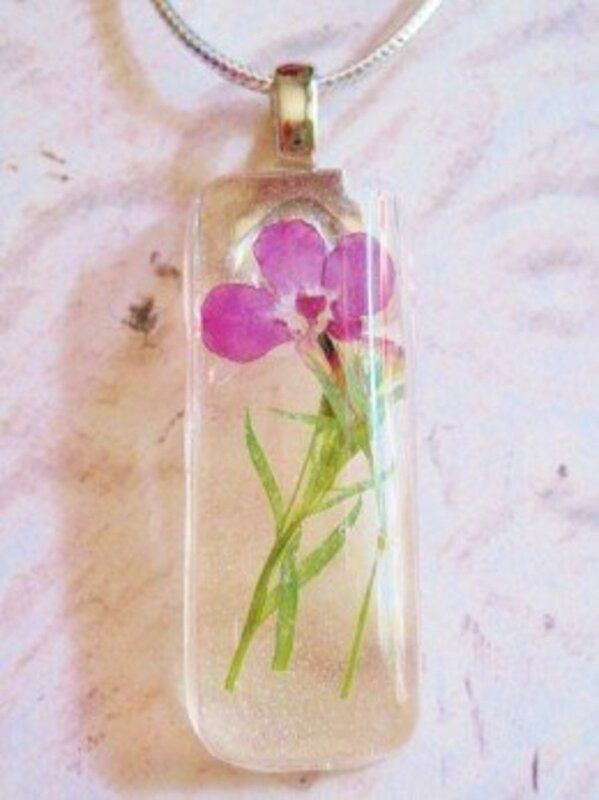 This craft project is fun and easy and something that can be done alone or in a group. It is a great project to show how much loyalty you have for our great country. These handcrafted hemp bracelets are inexpensive to make and a good way to share in creating one of a kind designs and ideas with friends and family. 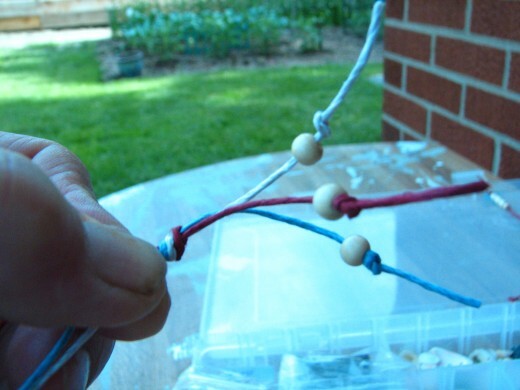 Have fun handcrafting your 4TH of July hemp bracelets and have a happy and safe holiday. 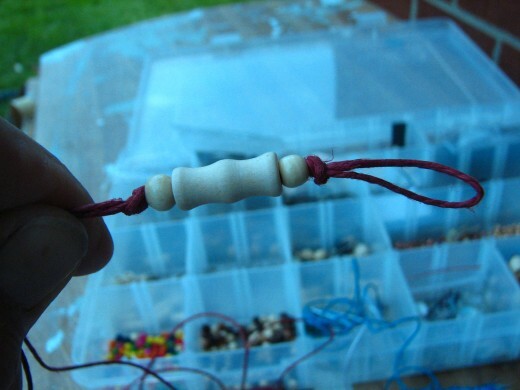 I've been wanting to learn how to make hemp bracelets forever. Very glad I found you here on Hubpages. Very good instructions, clear and easy to follow. The pictures are beautiful and a big help to understanding details. A great big thanks and thumbs up to you! Ya those are defenitly pretty simple bracelets. Easy to learn and make. Would be great for a kids craft. I am a jeweler and written few hubs about Gems and Jewelry. I liked your creation and your hub. when I was still in school, I love doing different kinds of bracelets using different kinds of materials to be given to my friends as friendship bands. thanks for the new idea. I believe that sometimes simple is more appealing and makes it good for everybody to do. Thanks for the upbeat comment and hope your holiday weekend is a great one. These are easier to make than some of the others I have seen, and you have given a great idea for celebrating the Fourth of July! Will have to re-read your instructions and share with my almost teenybopper granddaughter who will love doing this. Happy Fourth of July, Happy Birthday USA! Peace to all our world also. Thanks, C.S.A! I hope they do and wishing them a very special 4TH of July. Thanks for commenting, best regards. Great idea! My kids will love it. SweetiePie....your faith keeps me going! What a great idea for the fourth of July. I just knew you would think of something really cool! I think there are quite a few farmers growing hemp in California! I didn't realize you can buy hemp products here in the states. Too bad they wont let farmers grow at least this kind of hemp. Yes I remember hemp in shades of green only! Kidding aside. I take my photos, place them in the hub and then write what I have done in the picture if that helps you any. It seems to me to be the easiest way to write the "How To" hubs. Thanks for reading and commenting. Look forward to the home and garden hubs, love to learn new stuff. Yes it is rnmsn and doing it with hemp is even funnier! isn't it wonderful that the first "tying knots in rope" we learned as teenagers (macrame) is the first one we are teaching our childrens children? great hub thank you alexis! using hemp for making bracelets is what you meant...right? otherwise the instructions might not be so clear...I jest. Thank U.
and you make time to visit with this project and lend some education...unknowingly at first. Guess that depends on how old your granddaughter is. Glad you stop to read here and leave a comment. Thanks. Really cute bracelets. My grand daughter would love to do this. Thanks. Great stuff! I like that you are using hemp. Good, clear instructions. Many thanks for this hub!